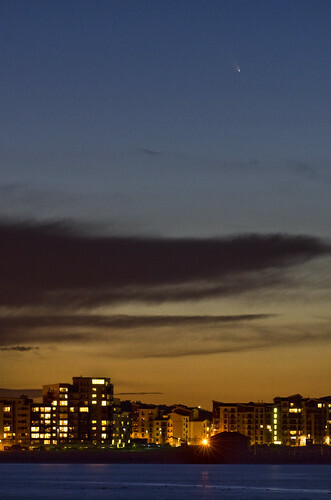 So, since the 8th of March Comet Pan-STARRS has been gracing the Northern Hemisphere skies and true to form for any notable celestial event, it’s been largely clouded out in the UK and especially up here in Scotland. 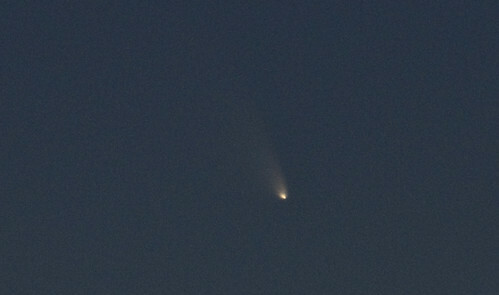 Thankfully this comet isn’t just a blink and miss it event, there were at least a few days to try and catch something. 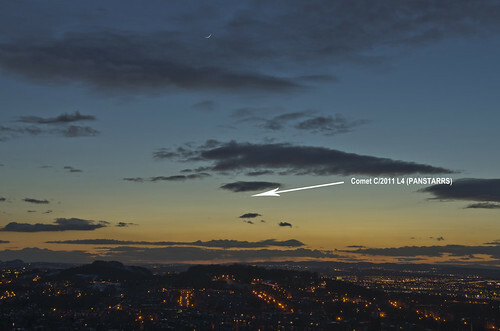 By Tuesday 12th March the first shots of PANSTARRS were coming in from other parts of the UK, the comet easy to find next to a very young crescent moon. I had to wait till the night of the 13th though for a first attempt. Stood on top of Blackford Hill in what can only be described as Baltic conditions I searched in vain for the comet, despite a reasonably clear sky to the west and only actually spotted it in one shot after I got home and it’s hardly the clearest view of it, which was disappointing as other people seemed to have got some reasonable efforts. The night of the 15th brought an unexpected chance though. The forecast was predictably wrong although for once in a good way. 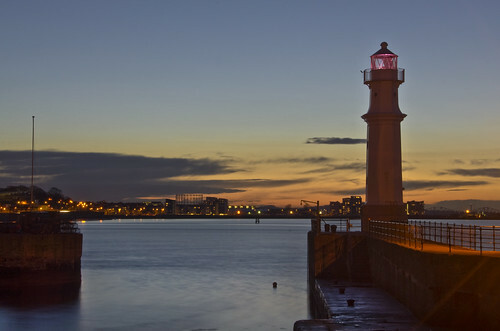 The skies started to clear around 5pm and just after 6 with still clear sky I figured it might be worth a try, this time from Newhaven Harbour, which has a fairly clear view to the West. Arriving at Newhaven it looked reasonable but for one patch of dark cloud moving in slowly from the West. This time I decided to wait until 7.15pm before searching for it and made the most of the tail end of a nice sunset in the meantime. 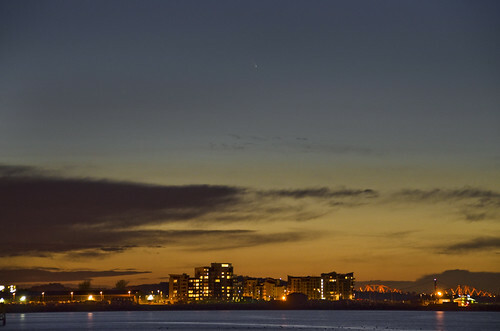 By 7.15pm I was out by the lighthouse with a clear view over to Granton Harbour, using a compass I found exactly where West was and started to take shots of the sky with a 200mm lens, ISO400 and shot exposures. First sweep across the West turned up nothing, 2nd attempt and around 12 shots later, there it was, higher than I expected and very visible in the photograph. With an idea of where it was now I could try for a few wider scenic shots. The last thing I wanted was just pics of the comet with no context. I wanted this to be recognizable as Edinburgh. The comet isn’t that visible in this shot, but it’s there dead centre towards the top of the image. Switching to my Sigma 70-200mm f2.8 EX HSM and 2x teleconvertor I went for a closer look still trying to keep the Granton flats in the frame, this was probably the best shot of the night. Finally, it would have been rude not to have a go at the comet at the full 400mm reach and what a stunning sight it was. By this time it was visible in the viewfinder and I swear it was naked eye visible once you knew where it was. I finished the night with a peek at Comet Pan-STARRS through my 15×70 binoculars, a truly stunning first encounter with a comet. It’ll be about for a few weeks yet so if you get the chance, do some research as to where it is in the sky and get out and give it a go!